Let me begin by expressing my gratitude. I found it very pleasant to meet you and listen to what you had to say when you visited The School of Film Directing here in Gothenburg in connection with receiving you're honorary Doctorate a couple of years ago. I apologize if I and mademoiselle Lindbom bothered you repeatedly with requests about coming to visit and make a filmed interview with you. I understand you have more important things to do. For have you not, just as your friend Chris Marker, once and for all adopted a strategy of silence? If that is the case you nevertheless have my full sympathy. Becket comes to mind, who never during his lifetime let himself be interview. There's a wonderful picture taken of him, just after he's been informed that he's won the Nobel Prize. Taken by a Swedish TV-photographer the prized one stands as if carved in stone with a fixed gaze not uttering a word. A picture was as far as he would go, no verbal outpourings. I can understand that you don't find it very rewarding to dissect old films. If someone wants to get to know the films you've made, they can watch them and read about them, you say. I agree. Dissection was certainly not my intention. I am currently interested and involved in the filmic essay form a field where you have worked quite a lot and I would gladly have heard your thoughts about it. But what is there really to say? "A reportage, A homage, A n essay, A regret, A reproach, An approach?" you ask at the end of Daguerreotypes. Well, does it really matter what it became? And why it became what it became? Time is relentless, but it can be revoked in dreams and preserved on film. Those are my thought when watching you're chronicles of Rue Daguerre. It's rather fantastic that I immediately can see what the street looks like today with the help of Google Maps. It's much the same as it was 37 years ago. I find you're Cine Tamaris on 88 Rue Daguerre and it strikes me that Simone de Beauvoir lived only a stone's throw away in her one room apartment on Rue Victor Schoelcher. It's not without sadness I realize that Au Chardon Bleu is nowhere to be found on your street. Considering Monsieur and Madame Chardons age at the time when the film was made I suppose they have passed away. 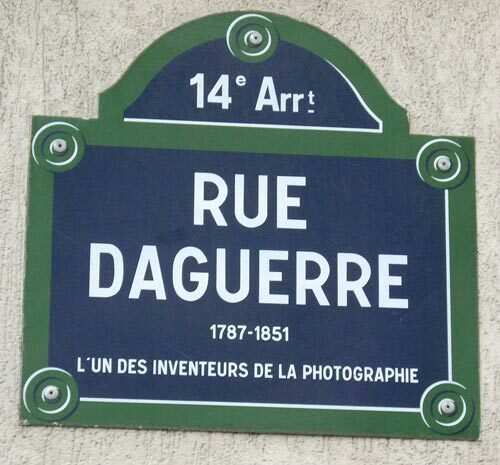 But thanks to you they live on together with the other daguerreotypes, even within me who has never set foot on Rue Daguerre. What is it with Madame Chardon Blue, as you call here, that fascinates me, makes me like her, makes me feel both sorrow and happiness when I see her. Do I see something of myself in her? Why are you so fascinated by her? Her mysterious revelation is endless. I can imagine rational explanations for her state of mind but these explanation feel insignificant. One of which you imply in you film. In her line of work she's sold jewelry and when this is no longer profitable she becomes idle next to her husband who continues to take care of the perfumes. At the same time I see great love between the two, like when they visit the butcher together in the evening to buy a piece of meat. The way the look at each other, they're posture. There is tenderness. You see how well dressed they are, Monsieur and Madame Chardon, even when just going next door to pay a visit to butcher. Monsieur Chardon is the one to handle the purchase. Then a slight detail. A detail that says so much. Madame brushes something of her husband coat. Casually but with such care. They radiate such humbleness towards each other and their surroundings, why do I perceive that to be so unique? And for the scene when the young women enter the shop to buy make-up. When Madame, muttering about in her own world, starts plucking at the women's clothes. For a moment I think "Oh no, something is not quite right with Madame Chardon Bleu. This is not normal behavior. Unfortunately not". The women pretend not to notice her, probably because the see her as being ill. Then I pull myself together. Why should it be Madame Chardon Blue who is ill. Why not all the others. When Madame Chardon Bleu so insistently looks out through her shop door window, what does she see? Is it what goes on the street outside that interest her? I get a feeling she sees much more than so. It reminds me of being twelve years old, sitting in the class room, absent minded looking at the blue skies above. Wanting to be somewhere else, although with a sense that somewhere, only exist within oneself.